Leading Manufacturer of bucket 25 frosty lehar from Delhi. 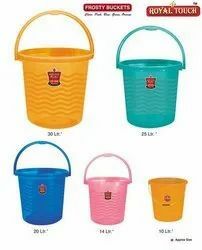 Plastic frosty bucket 23 ltr. Capacity with plastic handle. Frosty colors- blue / green / pink / orange / clear. "We deal only in bulk quantity"